If you are one of the BlackBerry faithful out there you obviously use BlackBerry Messenger, and you’ll want an easy way to share your BlackBerry Pin, so there are two convenient BlackBerry apps available so you can do so, the My PIN Barcode app and the PinShare for BlackBerry free app. The My PIN Barcode for BBM simply allows the user to show their pin with just a single click, and if you wish to access the My PIN Barcode app from within any application, you can assign ‘MyPinBarcode’ to your handset’s convenience keys. With the My PIN Barcode for BBM app the barcode contains your device PIN that is unique to your BlackBerry phone and associated to your BlackBerry Messenger account and as such identifies your BBM account to those you show the PIN to. The My PIN Barcode for BBM app can be downloaded from BlackBerry App World as a free download. Then there is the PinShare app for BBM, and is the first BlackBerry app that quickly connects you via BBM to other people via your BlackBerry PIN, and allows the user to effortlessly flip from one profile picture and short self description to the next. 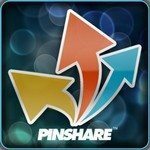 The PinShare app for BBM enables the user to view hundreds of PinShare profiles within minutes and when you locate someone you wish to talk to you connect and send messages without giving away or exposing your PIN. 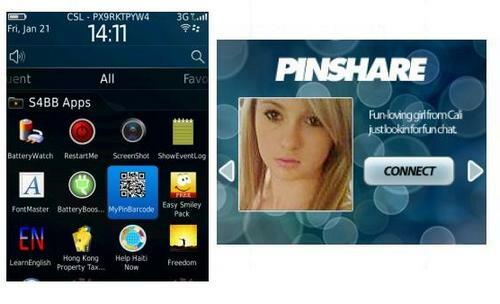 The PinShare app for BBM is again a free app download to your chosen BlackBerry device from BlackBerry App World.